Neychelle, 15, is giving back to FYSC and the community by helping lay the groundwork at the Headquarters. As a middle schooler, Neychelle Thomas felt most at home in nature. She remembers the peaceful grounds at Family and Youth Service Center, where she once lived as part of THRIVE, a boarding school for at-risk students. She’d pluck a book from the shelf in her dorm room and weave through the gardens to a swing or hammock and read, swaying with the trees. That was then. Now a 15-year-old sophomore at Lee Magnet High School, Neychelle is excited about the robotics program she’s just joined at school. She’s no longer with THRIVE, no longer lives among the hammocks and gardens of the FYSC campus, but she’s eager to stay involved. The THRIVE program has outgrown the facility, too, and moved to a new spot on Brightside Drive. FYSC executive director Roxson Welch with youth leaders Neychelle Thomas and Reggie Washington in the Youth Empowerment Headquarters’ common area. Neychelle is here at FYSC today, helping launch a new use for the old dorms. She’s a member of the Baton Rouge Youth Leadership Council, a group of about a dozen volunteer kids from around East Baton Rouge Parish who will guide this building’s transformation into the Youth Empowerment Headquarters. FYSC is home to multiple organizations all aimed at young at-risk students in the parish, including the city’s D.A.R.E. and truancy programs. As FYSC’s Youth Empowerment Headquarters continues to come together over the next year, it will serve as a hub for outside-of-school activities for local kids: after-school and summertime programming centered on extracurricular activities and fostering connections within the community. Roxson Welch, FYSC executive director, oversees every part of the operation, including the development of the Youth Empowerment Headquarters over the past year. She works with students like Neychelle every day, assisting around 5,000 families and hundreds of kids a year to tackle truancy rates in the parish and bring down youth crime statistics. In addition to boarding schools like THRIVE, a major component of battling truancy, she says, is finding a meaningful way to engage kids in community programs. The arts, Welch says, can unlock a lost student’s interest in learning and community. 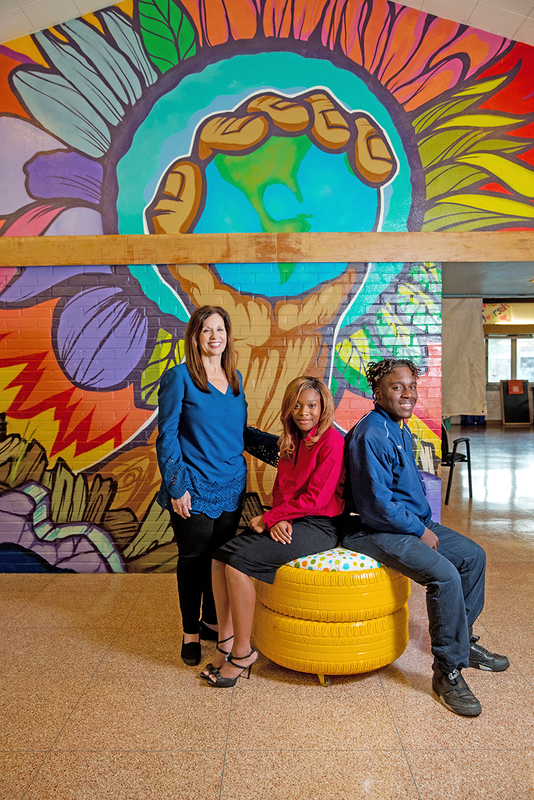 In the building that’s now the Youth Empowerment Center, the dormitory common areas have been transformed with vibrant murals by local artist Marc Fresh. Salvaged tires have been painted and DIYed into rolling ottomans, while a stage for slam poetry sits under clocks displaying times in cities across the world. Down the long corridor, the former bedrooms have been converted into workshops or studios for different activities, around 20 rooms each outfitted almost entirely with donated furniture, equipment and materials. 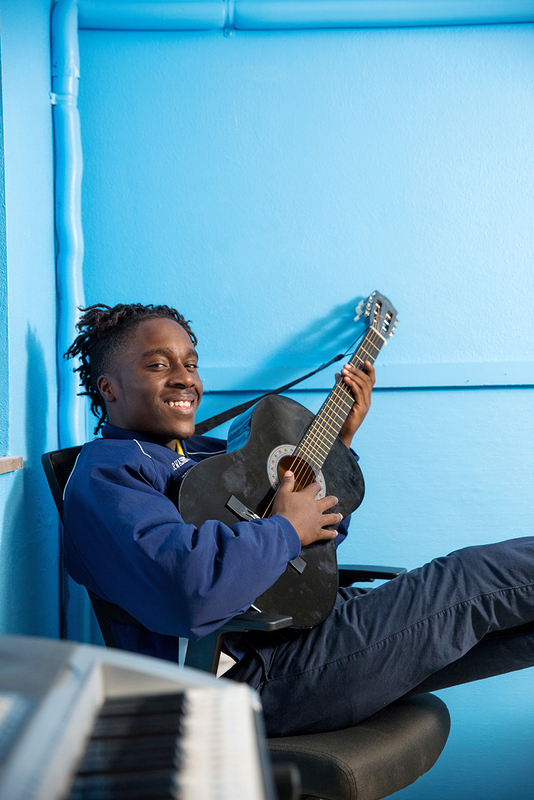 Reggie, 16, makes himself at home in the Youth Empowerment Headquarters’ new music studio. One room centers on fashion design, with sewing machines, dress forms and fabric. A computer lab gives students a chance to learn about programming and robotics. A music studio offers a keyboard, guitar and other instruments. The space is decorated with a portrait of Louis Armstrong—a Louisiana legend who was once a disenfranchised latchkey kid failed by the system. The rest of the rooms have giant construction-paper question marks stuck to their doors, an invitation to the Youth Leadership Council to decide what activity should be there. Right now, the young leaders are meeting monthly to plan programming, with subjects like journalism, video game design and cooking on the table. FYSC staff leads some of the programming, but most of the skills will be taught by volunteer experts from the community. A local yoga instructor leads an all-ages class every week—one option for kids who struggle with anger management—while one of Welch’s friends, a lawyer, will visit soon for a workshop on citizen’s rights. Welch hopes to bring in adult volunteers from as many different fields as possible to share their skills with the youth, with programs ranging from one-day workshops to three-week seminars to recurring classes. The music room is what most appeals to Reggie Washington, a 16-year-old at Madison Preparatory Academy who plays piano and dreams of making it big in the MLB. He says he wants to use that success to come back to Baton Rouge and build a park one day. Like the kids on the council, Welch envisions a future for the Baton Rouge community built on the youth, fueled in part by these engaging programs that bring together kids of all backgrounds. The headquarters is open to all. As Welch says, kids are kids. She recalls a youth program where she worked with kids of mixed backgrounds and an activity in which she’d ask the students about the best and worst things that happened to them each month. For the most fortunate ones, the best thing might be a new car or prom, while the worst thing might be getting grounded and losing the keys to the car. For the least fortunate, the best thing might be a loved one returning from the hospital or jail, and in one case, the worst thing was that a friend had been killed. This article was originally published in the January 2018 issue of 225 Magazine.